Truck Trailer Safety Chain Holder to suit 8t | 13.5t | 22t | 30t Trucks. Truck trailer safety holders with 4140 high tensile pins are mandatory on vehicles that weigh over 3500 kg. Where a trailer is considered a vehicle. 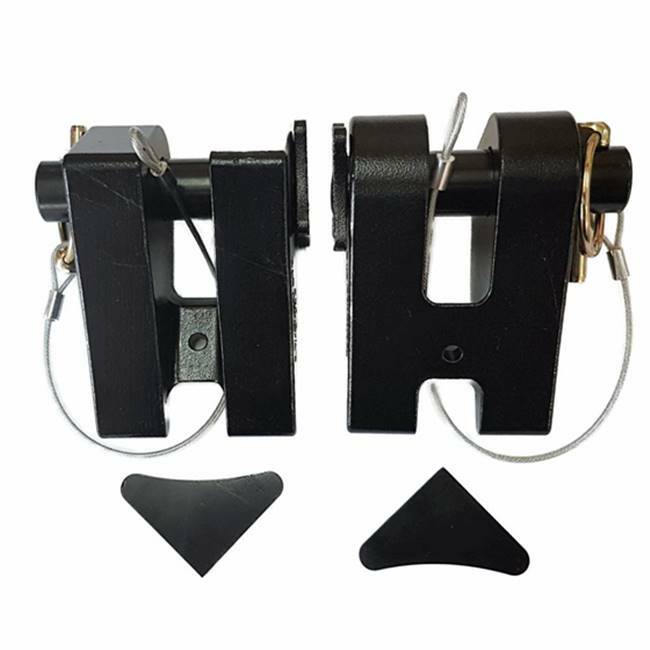 The truck Trailer Safety Chain Holder is an innovative solution that prevents the dragging of safety chains attached to the towbar. The safety chain holder is welded to the tow bar. Safety chain holders can either be welded directly to the trailer. 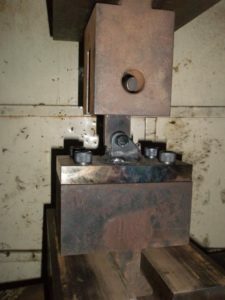 The holder may also be welded to a plate which is affixed to the trailer via 4 x high tensile bolts. Testing safety chain holders is the starting point of road safety. Road safety starts with product safety and product testing. Rigorous product testing is undertaken before the product is passed for the consumer to purchase. The 200t press above is set up to destroy the safety chain holder to its breaking level and record the data. Welding plays a crucial role in safety. Incorrect or unprofessional welding causes dangerous situations. Every truck with a tow bar tow a trailer over 3.5t must have attached to it a pair of safety chain holders. Mounting these holders on either side and adjacent to the tow bar coupling makes towing easier. However, Road Trains are an exception to the rule. Furthermore, the attachment must be able to withstand static forces that incur during towing and in particular, be resistant to cracks or breaks. 8t x 10mm Herc Alloy Safety Chain Holder. 13.5t x 13mm Herc Alloy Safety Chain Holder. 22t x 16mm Herc Alloy Safety Chain Holder. 30t x 20mm Herc Alloy Safety Chain Holder. Finally, towbar safety chain holders differ to trailer mounted safety chain holders. Firstly, the lynchpin to enables the pin to be removed and re-attached from the holder. Secondly, the trailer safety chain holder uses a split pin which is removed via the use of a tool. In conclusion, use with Herc Alloy safety chain only.